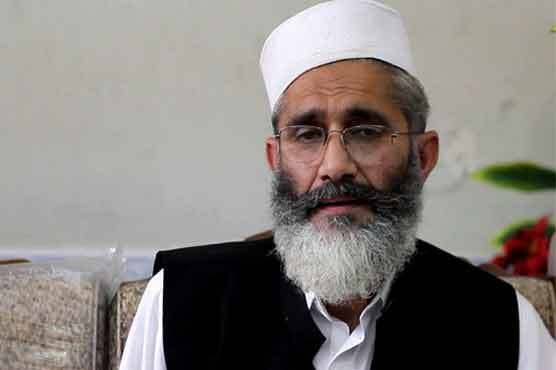 LAHORE: Jamaat-e-Islami (JI) chief Siraj-ul-Haq said on Wednesday that the meeting between Prime Minister Shahid Khaqan Abbasi and Chief Justice of Pakistan (CJP) Mian Saqib Nisar could not be without any purpose, adding that his party would keep a watch on its outcome. Talking to media after a meeting of the JI members from Okara on Wednesday, senator Siraj said that more steps were required to put the country’s politics in order. He said it was essential to free politics from those who consider politics as their housemaid and to carry it to those living in the huts. JI Punjab head Mian Maqsood Ahmed and Information Secretary Qaisar Sharif were also present on the occasion. He said that the slaves of the international establishment had done no service to the nation and the country as they had always been busy in pursuing their selfish ends. He said that the present rulers were also upset because they had failed to deliver and had lost the confidence of the people. Siraj termed the revival of MMA a divine blessing for the nation. He said that all the sects and schools of Islamic thought had united under the banner. He expressed the hope that the masses would also rise above petty differences and join hands with the MMA to build Pakistan as an Islamic welfare state and reject the slaves of Europe and the US through their vote. He said the goal of MMA was the enforcement of Nizam-e-Mustafa which was the solution to all the problems faced by the people. Stressing the need for an across the board accountability, the JI chief said that if the accountability process was left in the middle, the nation would be disappointed. He, however, added that the accountability should not disturb the election schedule. He further said that all those facing cases before the NAB should not be allowed to contest the election. He urged the CJP to seek an oath from the newly elected senators that they would not indulge in the sale and purchase of the vote in the Senate election. He also condemned the demonstrations in the Punjab capital and Islamabad by under the slogan “my body, my choice”. He said such rallies were part of the western agenda as the slogan had nothing to do with Islam and Pakistan. He said the western powers were spending billions of dollars to promote their views but it would not be acceptable in this country.